"Small steps, big ideas," is the theme of the third annual Atlanta Science Festival, which encourages all ages to step into a world of wonder and exploration through more than 100 events and hands-on activities in metro-Atlanta from March 19 to March 26. In fact, the party has already started via ongoing online activities, such as a chance to vote for Atlanta's favorite scientist and compose original "sci-ku" — or science-themed haiku. About 50,000 people are expected to turn out during the eight-day festival for talks, lab tours, film screenings, participatory activities and science demonstrations. The events are set at more than 80 different venues, including the Emory campus. "We've got a lot of fun and irreverent events, like 'The Science of Circus,' and others that are more on the serious side, like a discussion on climate change," says Jordan Rose, who is executive co-director of the festival along with Meisa Salaita. "There is something for everyone, from little kids to teens, college students and adults." A new event this year, "Sci-Cycle: A Competitive Scavenger Hunt on Two Wheels," will start things rolling on the opening day of the festival, Saturday, March 19. The Emory Spokes Council and the Emory Graduate Sustainability Group are organizing the bike adventure, to take place on the Atlanta Beltline. Participants will learn about materials science, urban foraging and sustainable practices through pedaling to various locations and performing tasks such as using a bicycle-powered blender to make a smoothie. Also new this year is a "Science Parade," set for the final day of the festival, on Saturday, March 26, starting at the Centennial Academy in downtown Atlanta. "Everyone is welcome to join the parade," Rose says. "We're encouraging people to come dressed as their favorite scientist, or element or other science-themed character." The half-mile parade, led by the Seed and Feed Marching Abominable band, will end at Centennial Olympic Park for the launch of the Exploration Expo, the culminating event of the Atlanta Science Festival. 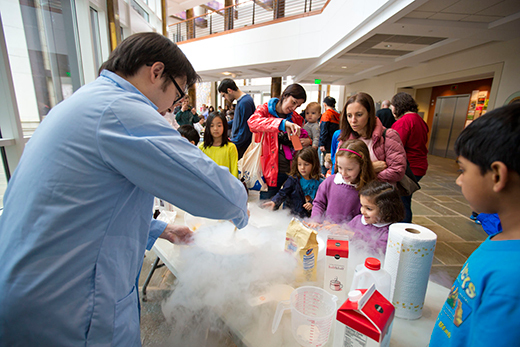 The free Expo includes stage performances and hands-on science activities at 100-plus exhibitor booths, including more than a dozen run by Emory faculty and students. Highlights of this year's Expo will include a giant LEGO build of the city of Atlanta, which will be 40-feet wide upon completion. "Everyone can help assemble a bit of it throughout the Expo," Rose says. A range of Atlanta Science Festival events will take place on the Emory and Oxford campuses, as well as the Carter Center. "The Atlanta Science Festival is a great way to feature some of the research and discoveries that are coming out of Emory for the local community," Rose says. "It's also a great platform for Emory students and faculty to practice their communication skills for a general audience, and to engage the public in their science." "Living in the Anthropocene: How Humans are Changing the World," will take place on the Emory campus Saturday, March 19. Emory scholars from a range of disciplines will explain how humans are profoundly altering the environment in a series of fast-paced, TED-style talks. Emory chemists will also reveal how small actions can have a big impact with a series of science demonstrations. A sustainability tour of the campus will show ways Emory is minimizing harmful effects to the environment. The "Zombie Outbreak Game" on Sunday, March 20, will require participants to follow clues across campus to investigate a mock Zombie disease outbreak, using real-world tools employed by public health scientists. Later that evening, Emory's Oxford campus will host "Oxford Under the Stars." Physicist Phil Segre will give an astronomical tour of the distant planets, moons and nebula. On the evening of Wednesday, March 23, The Carter Center will host a lively discussion, "What's the Deal with the Climate Deal?" The talk will include Emory faculty and students who participated in the Paris 2015 U.N. Climate Change Conference, discussing how the new global climate accord might work. "Discovery Dialogues: Human Evolution" will take place at the Emory Chemistry Center on Thursday evening, showing an incredible cast collection of fossilized skulls of our human ancestors. Join in a discussion with scientists from Emory's anthropology department about remarkable discoveries in human evolution this past year, from the unearthing of stone tools 700,000 years older than expected to the discovery of Homo naledi deep in a South African cave. Emory physics' popular "Physics Live!" returns on Friday, March 25. Faculty and students will provide exciting science demonstrations designed to dazzle children from grades K-12. A planetarium show and laboratory tours are also on the agenda. Educators are invited to the Carlos Museum on Friday, March 25, for the program "Integrating Art Conservation Science into Your Classroom Teaching." The program includes a special science tour of the museum and an interactive "science fair" of classroom-ready activities based on art conservation practices. See more details of Emory events, including times and how to register. Emory is a founding sponsor of the Atlanta Science Festival, along with Georgia Tech and the Metro Atlanta Chamber. The festival has grown to more than 34 sponsors, including Mercer University, Georgia State University, Google, UPS, the Clorox Company and Delta Air Lines. "We have more than 100 partners and great community support from businesses, educational institutions, museums and school districts," Rose says. The Atlanta Science Festival was one of 14 sites across the nation awarded the opportunity to speak directly to the astronauts on the International Space Station. Elementary and middle school students who won a lesson plan contest gathered at the Fernbank Science Center on March 8 to chat with the cosmic explorers via amateur radio. "It happened quickly because the ISS is traveling at 17,000 mph and they only had 10 minutes to talk before they disappeared over the horizon," Rose says.